I’d love to pretend that my attempts at cooking are preceded by careful meal planning, leisurely trips to the grocery store, soft music and casual chopping. I imagine there are actual people out there like that. Laughing to one another as they chop vegetables, sipping on a perfectly-chilled glass of pinot noir and then sitting down to eat a nice hot meal with a pristinely-cleaned kitchen in the background. Instead, a typical night inside casa de Murph involves an 8 p.m. decision to attempt a recipe I vaguely remember seeing in one of 3 cooking mags I browsed while at the gym (much to the chagrin of those around me I’m sure), blankly staring in the fridge to see if I have ANY of the ingredients said recipe calls for and hurriedly putting my knife skills class to the test as I throw things into my dutch oven. 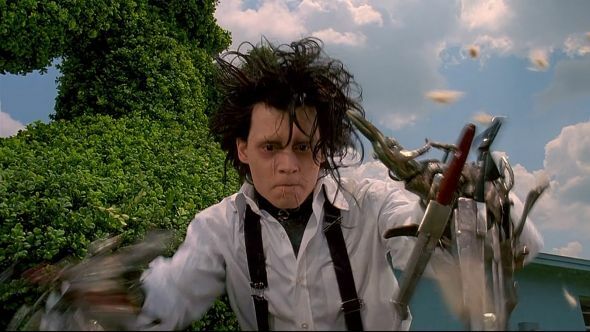 Remember that scene from Edward Scissorhands? Yeah. I’d imagine I look a little something like that. Scene: The BF had just gotten off a plane after a 24 hour trip to Columbus for a game. A snowy game. Apparently they had to plow the field 3 times before the game could begin. You may remember playing soccer in the rain post from a few weeks ago. Well, I don’t think these guys enjoyed the snow nearly as much. I, on the other hand, was wait-listed for my weightlifting class and on the fence about whether I’d get in or not. Finn was barking and staring at me, eagerly awaiting a trip to the park. Me: What do you think you want to do for dinner? Weightlifting class calls and says no-go. I decide to run outside instead. Me: I’ve been wanting to try this shrimp fried rice recipe I saw in Bon Appetit last month. Or maybe it was Cooking Light, or Self? I don’t remember. It looked really tasty. I don’t think I’ve ever attempted fried rice before. Did you see that the cardinals beat up on the Mets today? I don’t even know if I have any of the ingredients. I need to come up with something to make for Easter this weekend. I take Finny for a walk and to the dog park. He pounces on a pit bull puppy for a few minutes and then goes back to his latest routine of hoarding nasty mystery drool-soaked tennis balls in his mouth. He sets a PR with three in the mouth at once. I’m impressed. The other dogs stare blankly at him, obviously annoyed because there are no more tennis balls to play with. We head back home. I go out and run through Little Italy and Greek town. I’m hungry. When I return the BF is napping. I take Finn for another walk. I FaceTime with my parents. Like my nephews I think they are more interested in seeing Finny than me. I’m ok with that. He’s cuter. The BF wakes up. Me: So what are you thinking for dinner? BF: (holds up Bon Appetit issue from last month-aha it was that one!) This shrimp fried rice looks good. Do you have shrimp? Say what? No shrimp in the freezer. Me: How about chicken. Chicken fried rice? By that point it was happening. The idea of shrimp fried rice was filling our heads and no other animal or soy protein would cut it at this point. BF: I’ll go get some shrimp. Fortunately amidst the shrimp panic I realized that I was fairly prepared with the remaining ingredients that the recipe called for. Even fresh ginger. Point Sarah. I decided to start on the rice while I waited for my fresh fish delivery and make a big salad to go with it. 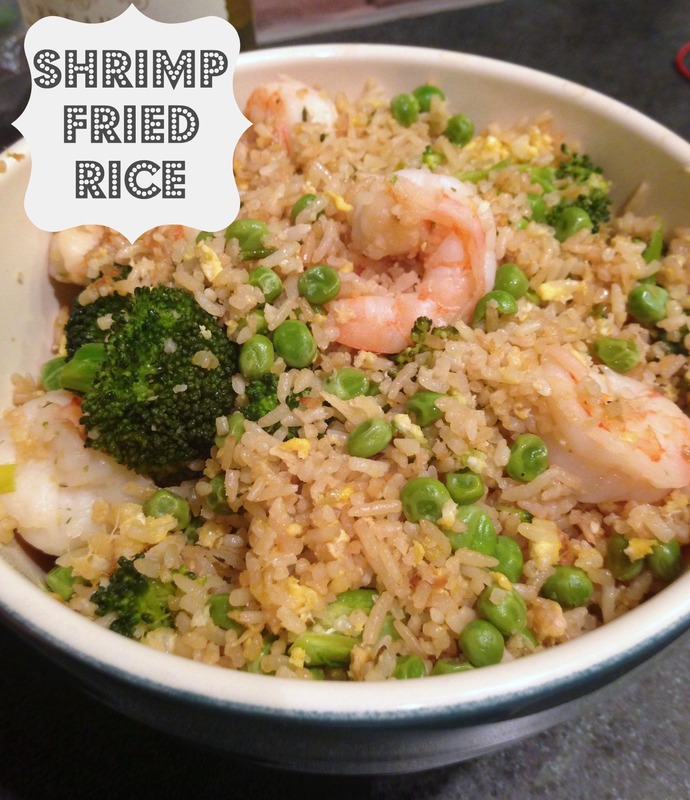 For a first-time fried rice maker, the recipe was easy to follow and really fast. Point Bon Appetit. The BF even returned with a bottle of wine to pair with it. Point BF. Heat 1 TBL vegetable oil in a dutch oven over medium-high heat. As pan heats, chop garlic, scallions and ginger. Cook for 1-2 minutes until fragrant. Add rice and stir to coat. Cook until rice is crisp. My rice was pretty fresh so it took a little longer to crisp up. Be patient. I was not. Once rice is crispy-ish, push it to one side of skillet. Add eggs to other side and cook, stirring and working into rice mixture, 1 to 2 minutes. Add broccoli, peas, soy sauce, vinegar and sesame oil. Toss rice often until vegetables are heated through. I used fresh broccoli so I let it cook until they softened a bit. In the meantime, steam some edamame for an appetizer. At this point I transferred rice to another bowl and added shrimp to dutch oven. Well actually I didn’t do this part at all. I showered. 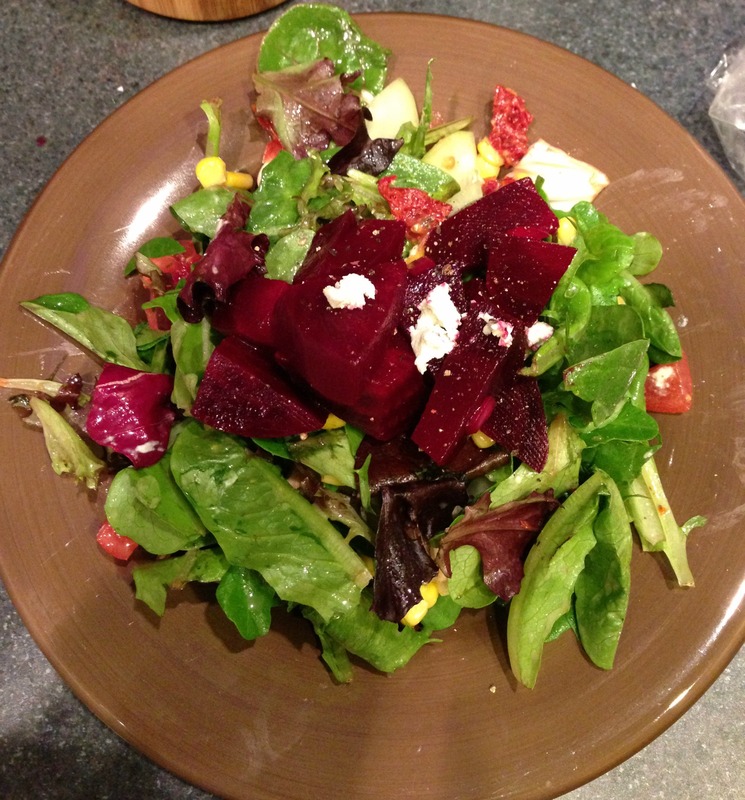 But the BF seasoned it with salt and cooked it until opaque. Once shrimp is cooked through, add rice back in and heat through. I like a little heat so I served mine with a chili garlic sauce like this one. If you want a little more acidity, add more rice vinegar. Prefer the original? Recipe adapted from the March issue of Bon Appetit. Reality may not always reflect the magazine meals that you imagine, but if you can share a good recipe, a nice wine and a few laughs along the way, it’s well worth it.